Brandon is back tonight with another of his Godzilla reviews! This one covers wave 3 of the small kit figures. Take it away, Brandon! Before the review I want to thank Michael for his kindness. Now this is the third installment of this superb Godzilla series, Godzilla Complete Works 3rd Set! In 2004 the Icon had his 50th anniversary, 1954 - 2004! Well now its his fifty-second as I speak! I have written two other guest reviews on Michael's page of the first two series' which you can visit them by scrolling down to the bottom of this page and clicking the links. I'm a huge Godzilla fan and if you read them you already know that! Now before I get into detail about this third series I will quickly explain what they are. They are small dioramas that range from two to three inches in height that need to be assembled but no glue is required and they're already painted and are made by Bandai and sculpted by Yuji Sakai. They are in a category called Real Product Stage. All come in the same box so you don't know which one you got. Their 're trading figures so their 're like our trading cards only Japan has figures. For those of you who have read my previous guest reviews of the Godzilla Complete Works I wanted to say a quick note, the Godzilla from series one I said was from Godzilla vs. Gigan it was Godzilla vs. Mechagodzilla and in series two the Godzilla 2000 was Godzilla 2001 from Godzilla vs. Megaguirius and the G.M.K. Godzilla was 2002. I apologize if I have confused some viewers. I'm only human and humans do make mistakes. Ok on to business this series of Godzilla figures consist of specific scenes from Godzilla vs. Monster Zero, Destroy All Monsters, Godzilla vs. Gigan, Terror of Mechagodzilla, Godzilla and Mothra: The Battle for Earth, Godzilla Millennium 2000, and finally but certainly not least Godzilla: Final Wars! All righty, that sums it up so let's see how these match up! The packaging is about the same as previously seen. Each figure is in an identical blind box so you don't know which one you'll get. The packaging is actually quite good. The boxes are sealed and all of the figures and their accessories come in plastic sealed bags. There are several sections in the bags that include Godzilla's tail, body, base, buildings etc. The plastic bags can fold and can be opened easily. Much like series one and series two they also come with small pamphlets with pictures of the figures on one side and a picture comparison on the other with the actual figure and the movie still. There are also those poison packets in the boxes as well so you'll want to get rid of them in hurry. The boxes are very colorful and shows the figures that are in the third series plus it also has movie stills on the back as well as a photo of the sculptor Yugi Sakai on the side. 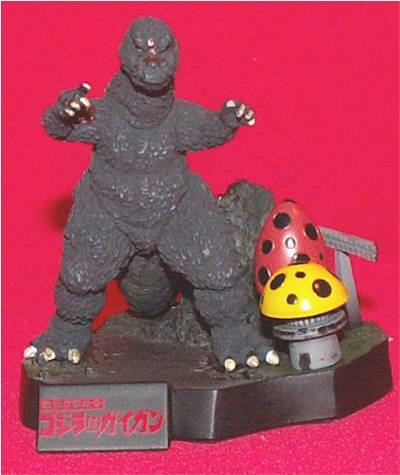 Most of the wording is in Japanese and even if you can't read Japanese you can tell its Godzilla! 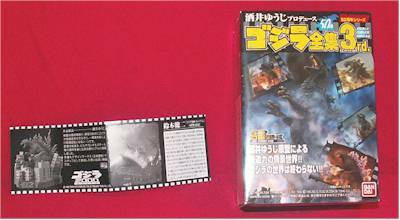 However it does say Godzilla Complete Works in English on the upper right corner on the front of the box. Its very nice packaging but it would get four stars if it wasn't blind boxes. true. Really, words can't describe how realistic and wonderful these little versions are! For such small figures the paint is just great. All of the Godzilla figures eyes are straight. The finger and toe nail paint is very good and the color that was used matches well. On his right hand Final Wars Godzilla's fingers has a little added paint on the bottoms of them than the other one. This is all I have noticed on any of the figures so yeah the painting is darn good on these especially for the size of them. I do like the colors used on these guys especially the blue spines on Final Wars Godzilla and the purple spines on Godzilla 99. Mothra's sparkles on Godzilla 1992 are very shiny and show up pretty well. The blood on Godzilla 72's face and right shoulder looks like its placed exactly where Gigan mauled him. Every figure is painted great. The buildings are painted excellently. The bases all have the title of the films the Godzilla figure is from on the front of the base with some English but mostly Japanese and all of these words are painted without blotches. Just great, great painting all the way around! 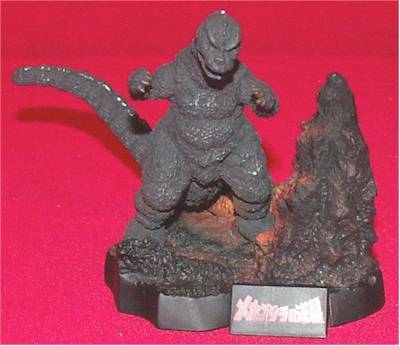 Each Godzilla figure includes his own base and some accessories that fit on the bases. 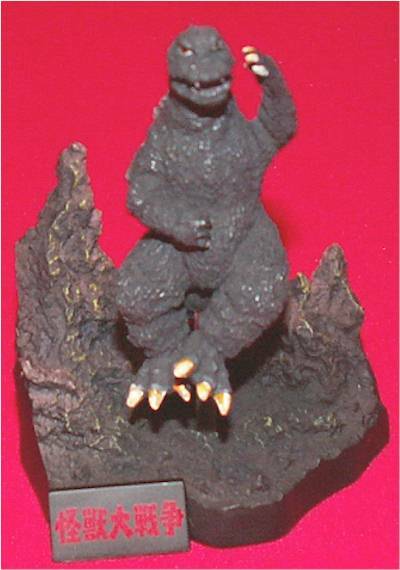 Godzilla 65 comes with a peg to help him dance. Big G 72 has some of the foundations in the Godzilla park. 92 Godzilla includes two separate buildings, two buildings that has a crosswalk and a boat that has four mast that you insert in the tiny hole but the rigging is already sculpted on. Millennium Godzilla includes six buildings. 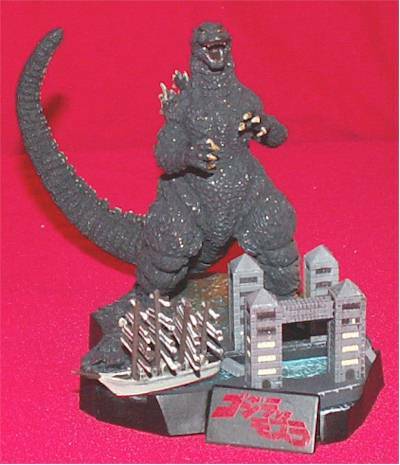 Like the one building that came with Godzilla 1985 in series one Godzilla 2000 has a building that has a Bandai sign on the very top of it. Final Wars Godzilla has two demolished structures. All of the buildings are expertly sculpted and simply just peg in. I love the water effect on Godzilla 92's base. Again, another feat is accomplished! I rate this category four stars because I just have a ball looking at them and admiring their realism. I'm sure most big Godzilla fans will appreciate the authenticity too. I have grown up with Godzilla and like I said earlier its a dream come true to own such a collection. I really don't know how kids would like them since their similar like statues. 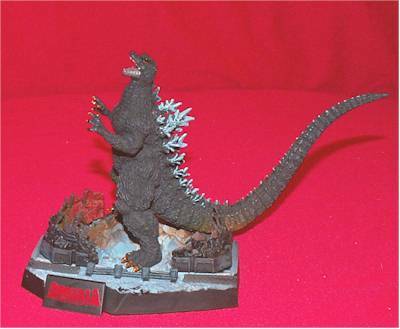 In My opinion these are for the major fans who love and adore Godzilla and want some awesome figures. This is such a fine series, in fact these guys and the previous sets are some of the finest figures money can buy! I'm ratting it four stars because I purchased a set and not a blind case. I paid $56.14 for the set and that includes shipping and that's a great price considering the amount of realism and such fantastic sculpts they have and that they are imports. I purchased them at Flying Turtle Toys located here in the states. I could have bought a case of ten for a cheaper price but I wanted all seven with no hassles. If you buy a case of ten you might be able to find them cheaper but you'll most likely have to buy at least two cases in order to get the entire set. Sure you might wind up with the whole set but you will also have duplicates. If you choose that way rate it a star and a half. To Me that is wasting money unless you have friends that want them or something. If you are like Me and want all seven of them check for sets on the web or maybe local hobby shops. I wouldn't pay anymore than sixty dollars for a complete set unless that's the only way to get them. 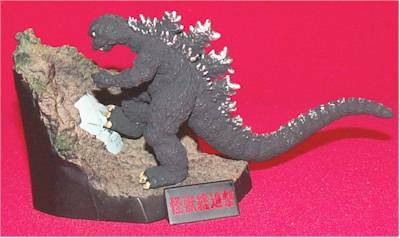 Since these Godzilla figures are small, have tiny pieces and are detachable from their bases so you'll want to take extra care for them. You'll also want to get rid of the poison packets right away as they are no good around a person. 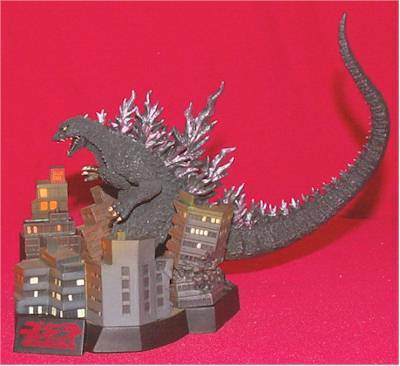 Also, I would not give these to youngsters as these are highly collectable pieces for the major Godzilla fan. This is arguably the best of the three sets so far. Although like the previous two this one has some of the best sculpting I have ever seen especially in this scale. I mean the painting is just marvelous and the figures are sturdy. They are completely compatible with the Series one and two sets. It's just an awesome set and it has made My Godzilla dreams come true! I bought My set from Flying Turtle Toys for $56.14 including shipping. They specialize in Godzilla and Japanese imports. I guest reviewed the first series here and the second set here. I also guest reviewed the Gamera Memorial Box Set here and I guest reviewed these but they ain't Godzilla or Japanese monsters but their famous and they are the X-Plus Ray Harryhausen vinyl figures. Michael reviewed X-Plus' Godzilla here. A guest reviewer gave his thoughts on the Bandai Movie Monster series Godzilla, Mechagodzilla and Titanosaurus here. Another guest reviewer gave his thoughts on the Real Action Heroes 12" Godzilla here. I have been an action figure collector all My life. I currently collect 12" Sideshow figures of Highlander, Universal Monsters, Star Wars, POTA, X-Files, Horror and others. I also collect G.I. Joe Sigma 6, Marvel Legends and sub-lines, SOTA's Street Fighter, Godzilla, Gamera and King Kong stuff as well as comics and movie books. I'm a big fan of Action, Sci-Fi, Horror and Monster films and I love movie Scores & Soundtracks, Baseball, Boxing, classic Video Games, Cryptozoology, Aliens, UFOs, Ghosts, strange phenomena etc. If you have any questions give Me a holler at Capri1981@aol.com! Figure from the collection of Brandon Miller.